I have been involved in cat rescue most of my life. When I was a child I was always bringing strays home and it broke my heart when my parents would make me find a new home for them. My mother once said, "Cindy, when you are grown up and have your own place you can have as many cats as you like." She would tell her friends and co-workers of her many grandcats and proudly whip out the pictures to show everyone who they were and what they looked like. I dedicate my cat rescue in her memory. Now, a little bit about my past experiences. I was with Friends of Pets for 10 years where I did cat rescue, foster and adoption as well as other volunteer duties. I left Friends of Pets in 2001 and co-founded the rescue group, Kitty and K-9 Connection. I was a director for 10 years, the past four as President, where I did everything there is to do in a non-profit animal organization which included rescue, foster and adoptions. When things took a turn with that group, it was time to think about venturing out on my own and that is what I am doing. Many people know me and recognize me from various animal events, my outspoken opinions, my jobs and the fact I grew up here and have lived in Anchorage since 1965. I work at Parks & Recreation and Alaska Veterinary Clinic. I am very active in the community, especially when it comes to animals and their welfare. 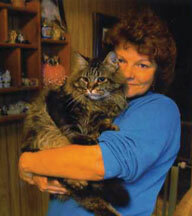 Kool Kat Rescue is a cat rescue organization dealing primarily with the rescue of adult cats. All pets have had medical check-ups, have been micro-chipped and vaccinated, and those 6 months or older are (or will) be spayed or neutered. Cats have been leukemia tested. Medical services are provided by Alaska Veterinary Clinic, 300 E. Fireweed Lane. The majority of cats in rescue are fostered in my home so I can tell you their individual and unique personalities and match the perspective adoptive home with the purrfect cat. My goal is to pursue each cat's placement into a permanent, caring home. Please understand there is an adoption process and fee. These fees are then turned around and used to help another pet in their medical needs, or towards the rescue of another unfortunate castaway. Cats are primarily rescued from animal control shelters, some are owner releases because of various circumstances and some are flown in from bush communities. Thank you for considering Kool Kat Rescue as your adoption site.